Sleepaway camp is such an amazing experience for kids. It’s a chance to spread their wings away from you, learn new skills, explore the wilderness and forge lifelong friendships! While it’s filled with so many positives, there’s one downside that can turn a fun experience into a nightmare: bugs! I’m not talking butterflies and beetles, here. I’m talking about the nastiest of the tiny critters: bedbugs, mosquitoes and lice. Don’t worry, though! We have a few great all-natural product recommendations to add to your packing list to keep those bad bugs at bay. Check them out! Even if your child loves creepy, crawly things, mosquito bites and bee stings can make summer camp unpleasant. So don’t forget the bug spray — just be sure to use one made for kids. Fairy Tales Bug Bandit promises to repel fleas, mosquitoes, ticks, and biting flies all with a mere spritz. Plus, it is free of harsh chemicals, pesticides, toxins, parabens, sulfates, dairy, gluten, and nuts that can trigger allergic reactions. There is nothing worse than a visit from Aunt Louise at summer camp! Close proximity in camp cabins and sharing caps and clothing create the perfect storm for a lice outbreak. To protect your child, simply pack a shampoo that will naturally repel lice. Fairy Tales Rosemary Repel Daily Shampoo gently cleanses the scalp while a proprietary blend of organic Rosemary, Citronella, Tea Tree and Geranium oils help prevent lice. Camp cabins are a breeding ground for bed bugs. Not only will they leave your child with itchy bites, but they’ll also be coming home with them in their suitcase (yikes). Bed bug sprays are often harsh and unsafe, so be sure to read the ingredients before packing one. Fairy Tales Sleep Tite Bed Bug Spray is an EPF exempt formula that is classified as minimal risk and uses natural ingredients that have been shown to help kill bed bugs and their eggs. 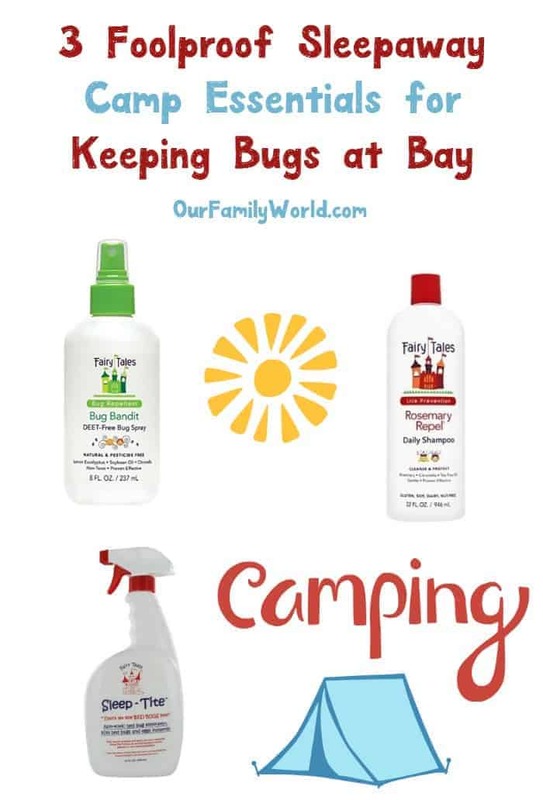 With these three all-natural products in your child’s suitcase, they’ll be free to enjoy their sleepaway camp experience without worrying about nasty bugs! What is on your sleepaway camp packing list? Share below! Thanks for these tips. I am not a huge fan of camping, partly because of the bugs! Thanks so much for these tips, I don’t even think about lice and bedbugs UGH. Oh my! I swear by this stuff… every kid in my daughters class got lice except for my daughter and it’s because of their lice prevention shampoo and leave in conditioner… two thumbs up from this mama! I am not a fan of bugs. Keeping bugs away is a must in the summer. These products look like great products and we will have to get them for our outdoor summer events. Bug spray is a big two for me because you know what’s a big nope? Bugs. I’m sure they have lovely families, but I dont want to meet them. They freak me out. Bugs of all sorts give me the heebie jeebies. Which is weird because I grew up camping with my family. I’m so glad there are things one can use to keep the critters at bay .. I don’t remember having much more than bug spray when we went. days, turning once a day, also kills bugs on smaller non-wash items.